The Wren fireplace with wood look beam and chamber is a unique blend of classic materials, modern technology and master-level craftsmanship. Classic limestone combines with modern faux wood to create a minimalist’s marvel. Its clean lines and a simple design are a canvas capable of showcasing the homeowner’s creativity. Smooth surfaces make cleaning the Wren a breeze. A 53” wide mantle provides ample space to display cherished photos, figurines or artwork, while a total height of 48” places such treasures safely out of the reach of young children. Limestone and the faux wood construction provide added safety and peace of mind, as both are non-combustible materials. Expert engineering, stringent quality control evaluations, rigorous safety and efficiency testing and professional installation make the Wren a worry-free investment in the beauty and comfort of the home. Unpretentious beauty, minimalist design and sturdy construction combine to make the Wren an ideal addition to any living space dedicated to simple living. With easy financing for qualified buyers, purchasing the Wren can fit any budget. Complimentary mainland UK delivery ensures the Wren arrives ready to become the heart of the home for years to come. 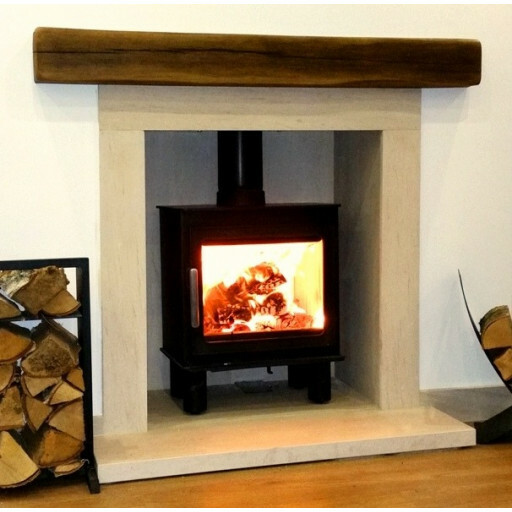 Lovely fireplace with realistic wood beam,our woodburner looks great in it. Our woodburner looks great in this Limestone chamber and we love the beam with the downlights.